Scheduling for janitorial services can become complicated with the need to manage recurring routes while maintaining flexibility. 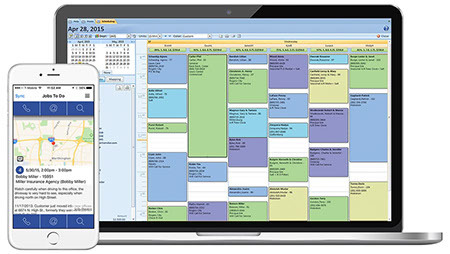 Smart Service janitorial service scheduling software has an easy and intuitive user interface that lets you drag and place different jobs across different teams and times. And with their connection to Smart Service via our mobile app, all field teams will get updated when they refresh the app. Scheduling and rescheduling has never been so simple. One of the best features of Smart Service janitorial service scheduling software is its comprehensiveness. To schedule a job you simply start to type a client name and Smart Service takes information synced from QuickBooks to fill the rest in. Contact data, service history, necessary equipment, and job notes are all automatically included in your new job. After creating a job, you can drag it to any open time slot or put it aside under jobs to be assigned later. You’ll love how easy it is to give clients on-the-spot answers to scheduling questions, and how simple it is to communicate scheduling changes with your team via our mobile app. The Smart Service software solution allows your dispatching to become as smooth and efficient as your scheduling. When you call your teams every single time there’s a shift in schedules, routes, or additional job information, you waste time. And all that wasted time can add up. Smart Service janitorial service scheduling software cuts that waste out. Any change made to a job in Smart Service will appear on the mobile app when users refresh the program. Your workers will see their schedules and routes remotely, allowing them to operate like a well-oiled machine. Even better, billing can also be done remotely. Invoices and new job estimates can be generated in the field and sent right back to the office for approval. Avoid lost or illegible paperwork and bill customers faster with Smart Service! The Smart Service janitorial service mobile app can be accessed from any smartphone or tablet with an internet connection. It’s really the swiss army knife of technology for your field teams. They can view their schedule in real-time, receive directions to jobs, contact customers, complete paperwork, and generate estimates all from the field and all with their phone or tablet. Not only that, but your office can monitor their routes throughout the day to check on progress. Change the way your office and your field workers communicate. Make work easier! Let us show you how scheduling software can simply your office regimen. Request a free demo of our janitorial service scheduling software today! Use these tips to mop the floor with the competition!